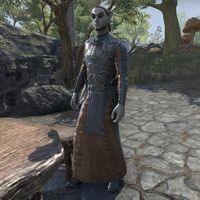 Adept Bilotan is a Dunmer mage and member of House Telvanni who can be found on a terrace just east of Tel Mora. "So it wasn't my imagination! Next time I complain to the steward about a strange smell, he'd best listen." What smell? The spores? "Yes! Exactly! That filthy Savarak was poisoning Mistress Dratha--all of us--but her steward could have stopped it if he'd listened. Maybe he was in on it?" This page was last modified on 14 February 2018, at 11:03.